Bucharest, 20 February, 2017: The Brewers of Romania Association has appointed in January a new leadership, with Shachar Shaine, president of United Romanian Breweries Bereprod (URBB) Company, as President of the Association, and Julia Leferman appointed as General Manager. Shachar Shaine will take over the position of President of the Association from Igor Tikhonov, President of Ursus Breweries Company, who has represented the Association in this position throughout the previous year. “The proposal received from the partners within the Brewers of Romania Association to take over the presidency this year honors me and makes me happy. I would like to thank my predecessor, Mr. Igor Tikhonov, President of Ursus Breweries Company, for the efforts made in the previous year as President of the Brewers of Romania”, declared Shachar Shaine. “The further development of the beer culture in Romania is one of the objectives of the Brewers of Romania Association, as the projects carried out throughout time were meant to raise awareness among Romanians on this amazing beverage made from natural ingredients, the various types in which it may be enjoyed, as well as the positive economic impact each glass of beer consumed has on Romania. I am glad that alongside my partners in the Association I have the opportunity to build on in this direction, so that the beer produced locally keeps its well-deserved place on the tables and in the hearts of Romanians”, added Shachar Shaine, President of the Brewers of Romania Association. Shachar Shaine has a 17-year experience in marketing and sales in the FMGC field and industrial project planning. A resident of Romania since 1999, Shachar Shaine is currently the President of URBB Company, after previously holding various leadership positions with the company: Marketing Vice-President URBB, for three years and Marketing & Sales Vice-President URBB for another two years, and President and CEO of the Company from 2004 to 2010. He graduated the Technion University in Haifa and has an Executive MBA from Bradford University. As of January, the General Manager position within the Brewers of Romania Association will also be transferred to Julia Leferman. 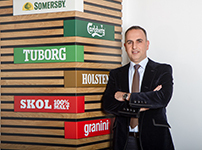 “I feel honored to be appointed in this position, all the more so that I am now able to say that I am part of a bigger family, of the beer producers in Romania. Joining Brewers of Romania team has been a beautiful professional challenge for me, given the fact that Romanians love beer so much. Brewers of Romania Association acts at the high standards of the beer industry and my role is to maintain those standards having a clear objective in mind: to promote and develop a responsible and sustainnable beer industry in Romania. The Association will also continue to act like an open and constructive dialogue partner on any beer industry related theme.”, declared Julia Leferman, General Manager of Brewers of Romania Association. Julia Leferman has an experience of more than 15 years in Public Affairs, acquired in significant public institutions, as well as in private consultancy. Before joining the Brewers of Romania, she was a member of the Grayling team, where she coordinated complex public affairs projects in various fields, such as: financial, IT, healthcare and energy. Prior to her collaboration with Grayling, she held key positions in the central administration as advisor on economic policies and European affairs for the President of the Chamber of Deputies and advisor on EU legislation in the Chancellery of the Prime Minister. She has a master’s degree in International and European Business Law with the Paris I Pantheon Sorbonne University, in partnership with the Faculty of Law from Bucharest, and a bachelor degree in Political Sciences and International Relations with the University of Bucharest. Beer production remains one of the major drivers of economic growth across the country, particularly due to its national character: more than 97% of the beer consumed in Romania is locally brewed, while more than 70% of the ingredients used to brew beer are sourced from Romania. As an immediate consequence of this, the beer sector directly and indirectly generates more than 84.900 jobs country-wide. 2019 © Copyright Brewers of Romania Association. All rights reserved.